Two weeks, two 12Ks, two VERY different experiences! 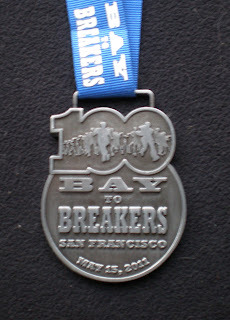 Bay to Breakers is legendary -- for the crazy costumes, the naked "Bare 2 Breakers" runners, and (in previous years) the crazy drunken participants. More city-wide party than race, it's still been one of those "must do someday" events in my book. Given that this was the 100th running, it seemed like the perfect year to do it. 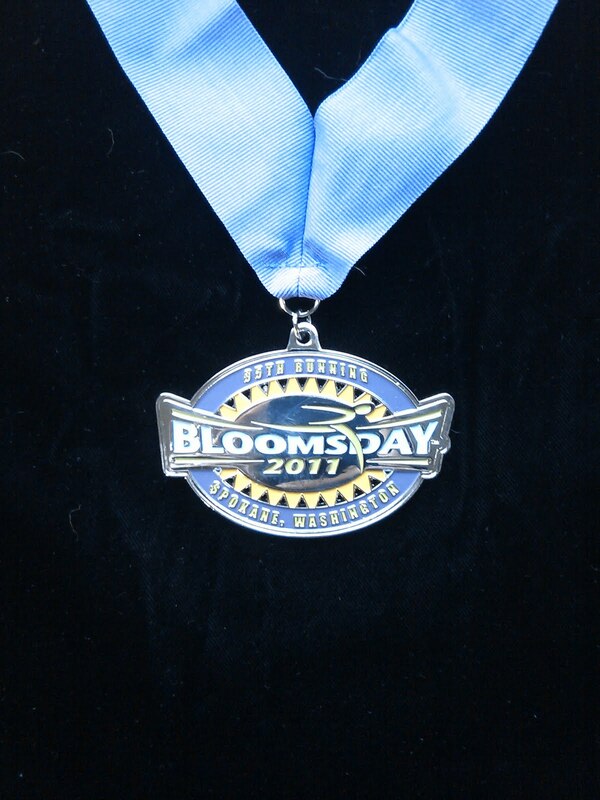 We had decided that we were going to walk the entire 12K -- injury plus not wanting to feel frustrated like we did at Bloomsday -- and I never doubted that we had made the right decision! We had also talked about using our costumes from the Bats Day "Swinging Wake" party, but the weather forecast was for rain so we just went with simple running clothes. Not being costumed was something we did regret. But, hey, there's always next year. Race morning was bright and perfectly crisp. We made our way the long way round the starting area, entering our "C" corral from Embarcadero. I felt a little bad at first; we wouldn't have signed up for that corral if I had known we would walk. That said, we were passing people the entire race -- seems that a lot of people just sign up for whatever corral they can get into. 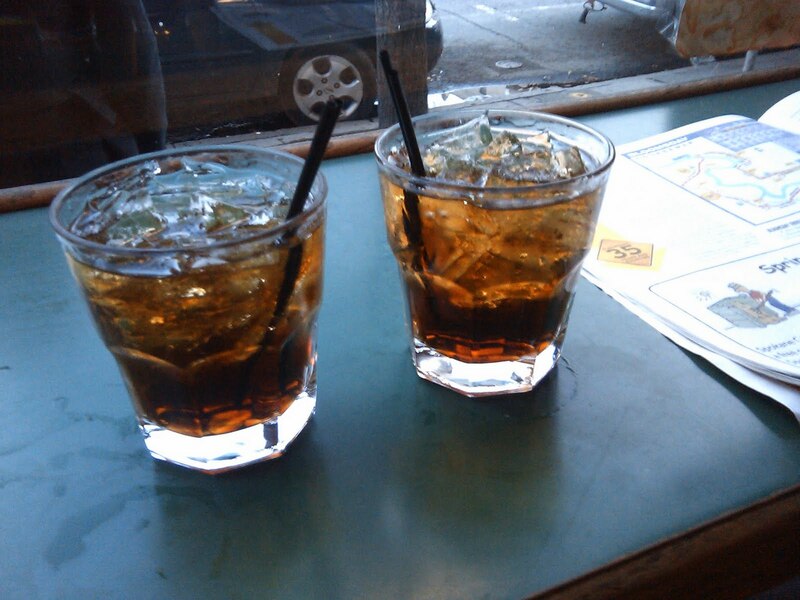 We walked around a little, drinking in the sights. Great to see so many costumes! At some point tortillas started flying. Just a few at first, and then dozens, and then, seemingly, hundreds if not thousands of tortillas filled the air. Bizarre. 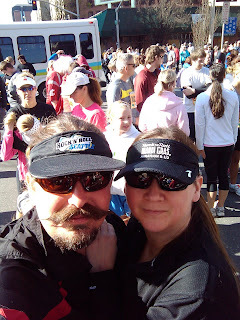 Then, with a slow lurch, we made our way to the starting line. I assure you that we crossed the start line much more quickly than we did at Bloomsday! 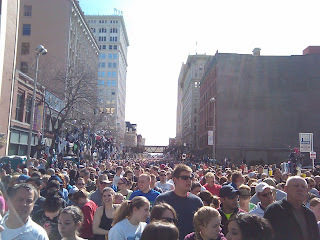 I heard some people grousing about the wave start and not being able to find room, but at least in our corral, there was plenty of space for runners (on the left) and walkers (on the right) from the very beginning. At one point a group of tipsy twentysomethings were running down the sidewalk in the opposite direction past us. We heard the alpha male start to catcall at an older naked man walking nearby. Alpha male: "Hey! Look at the naked dude! Ha ha, naked old dude! Hey --- OH MAN! HE'S HUGE! Respect, man. Respect." We entered Golden Gate Park surprisingly early in the day... and just in time for a weird little rain shower. Only a couple of minutes long, and not particularly hard rain, but enough that we put our jackets on. And then it was gone, and the sun returned. Glorious! Another phalanx of horsey cops (which we saw as "pretty" but later realized were serious -- if not yet implemented -- crowd control) and we headed down the hill, past the bison paddock, the waterfall, the Foot Stock finish festival (which was a little weird...) and then the windmill. And, of course, there were the Breakers. The wind was gusting and the sun was gone as we made the final turn onto the Great Highway. Another strange finish line completely devoid of spectators... but we crossed, kissed, and were done. Or so we thought. First we had to weave through the race photographers, who had set up themed backdrops so people could have their pictures taken. Then we started trudging towards the festival, all the while wondering if we had somehow managed to miss picking up our medals. On and on we walked. Not a big deal, really, but for a lot of people 7+ miles is a long way... so making them walk another 1.5 miles seemed cruel. 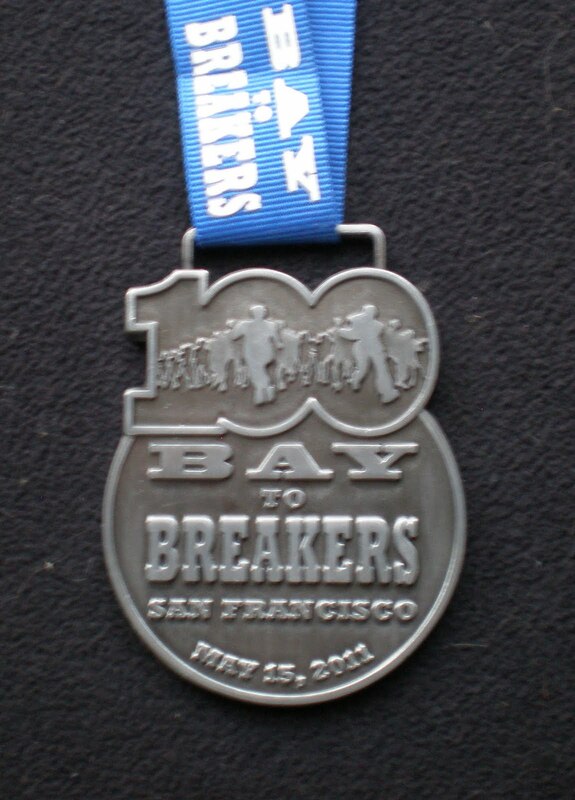 We reached a bottleneck -- ah, medals! -- which were being handed out parallel to the road. Why it didn't occur to the organizers to hand them out perpendicular to the road -- so that people could flow through them, like at EVERY OTHER RACE IN THE WORLD, I do not know. But eventually we made it through that. 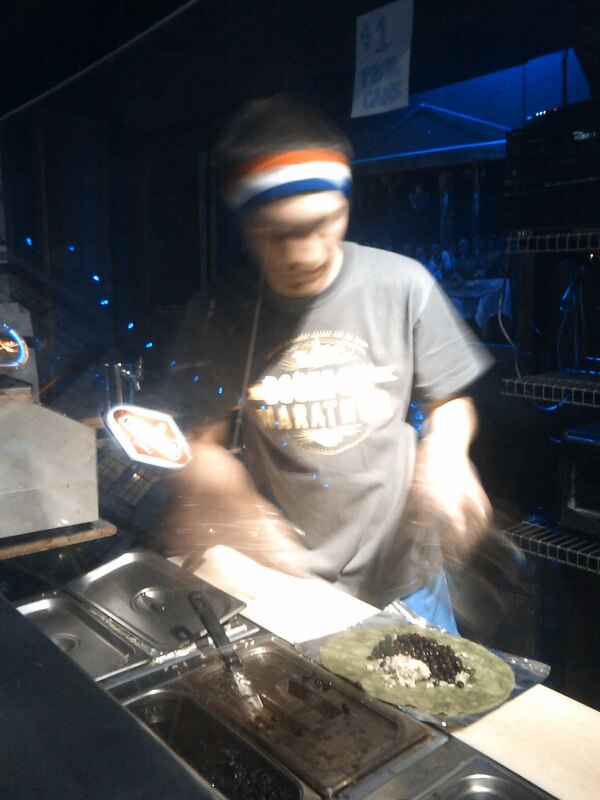 Then we hit the next crazy snag -- the food hand out. We fought our way through a crush to where two people were handing out bags of potato chips to people. Two men. 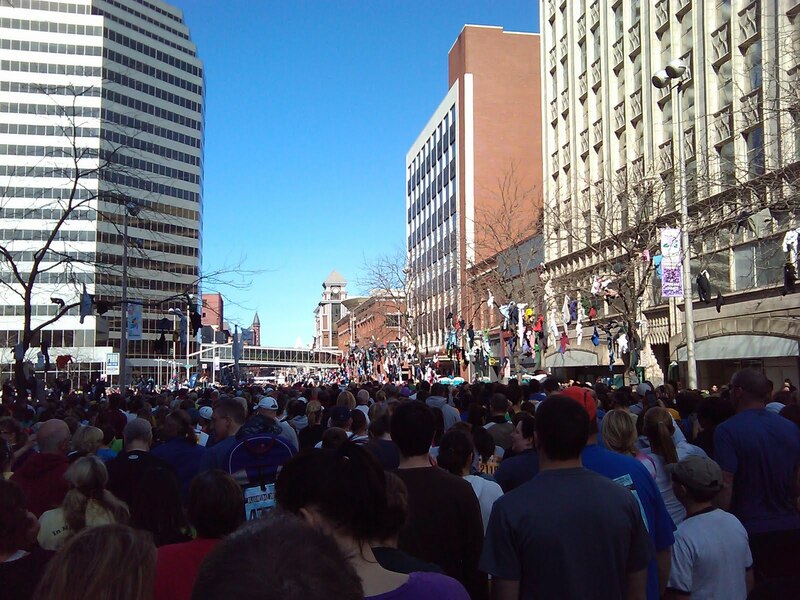 55,000 runners. Not good odds. Next to them were people handing out cheese. And then some other items. But that sort of post-race greed makes me insane. You know what I mean, the people with an armful of snacks. So we forced our way to the far side of the road and skipped the rest of the scrum. We did, at some point, manage to pick up a bottle of "sports drink" as well as a funny little plastic baggie of chocolate milk -- from the ONE vendor who figured out that you can put people in various places ACROSS THE ROAD. We bought a veggie knish, drank our sports drink, and wandered in the sun... but then decided to head out. Signage at the event was so awful that we completely missed the shuttles (which we had pre-paid for...), but we did manage to force our way onto a Muni a few blocks outside the park. Reading back over this report I worry that it has come across as too negative -- which I don't mean it to be. We had a fantastic time -- our only regret was not wearing our costumes -- and can imagine doing it again next year. 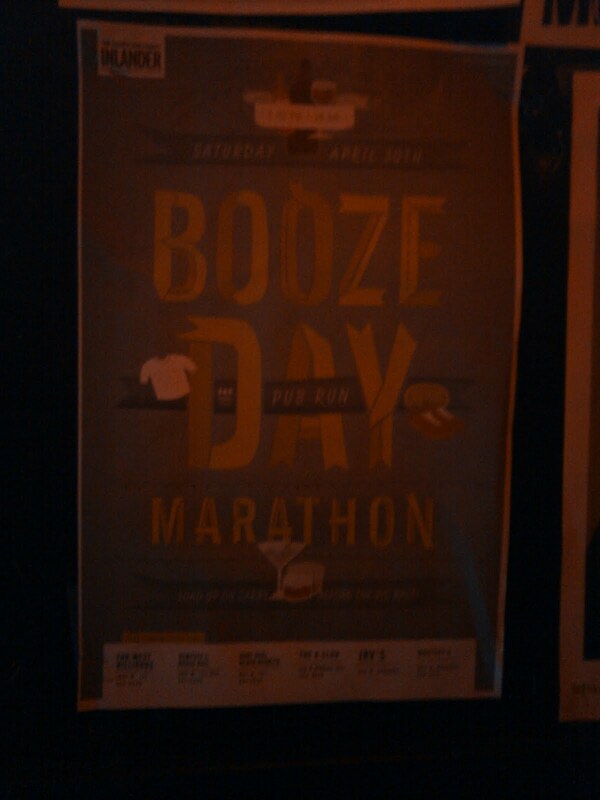 But we would also be aware that it's not the best organized of events (despite its 100 years!). Things I will always remember: the horde of oompa loompas. The Bare 2 Breakers men with their smiley-face balloons. The drag queen with the bubble maker under her Daisy Dukes. The tiny little banana boy. The giant birthday cake. "President Obama" holding a sign saying "thank you navy seals!" Strawberry Shortcake and friends. The flying tortillas at the start. 56,640. That's a lot of people. A LOT of people. That's NYC Marathon numbers of people. And, well, there's a lot more room in 26.2 miles for people to spread out. We woke up weirdly early to bright blue skies, then watched in dismay as a weird fog rolled in. 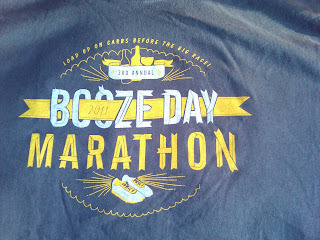 I'm happy to report that we weren't any the worse for wear after last night's Booze Day "Marathon". We also noticed, at 7:30, a few dozen people in the yellow corral that began at the end of our street. Luckily, in the hour or so that passed before we stepped out, the fog burned off and it was GLORIOUS. Perfect weather for a run! I liked the organization at the race -- at least what seemed like organization. 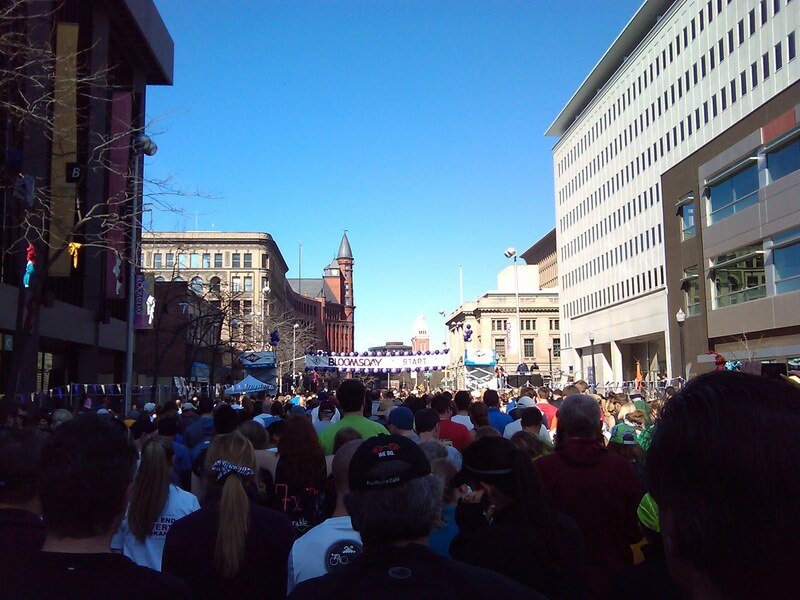 There were starting corrals grouped by color, and specific cross streets that led in to each one. We had been put in the orange corral. We got there a few minutes before 9, having been told that our corral would start between 9:15 and 9:45, and that we should be in position 30 minutes before that. Whatever. 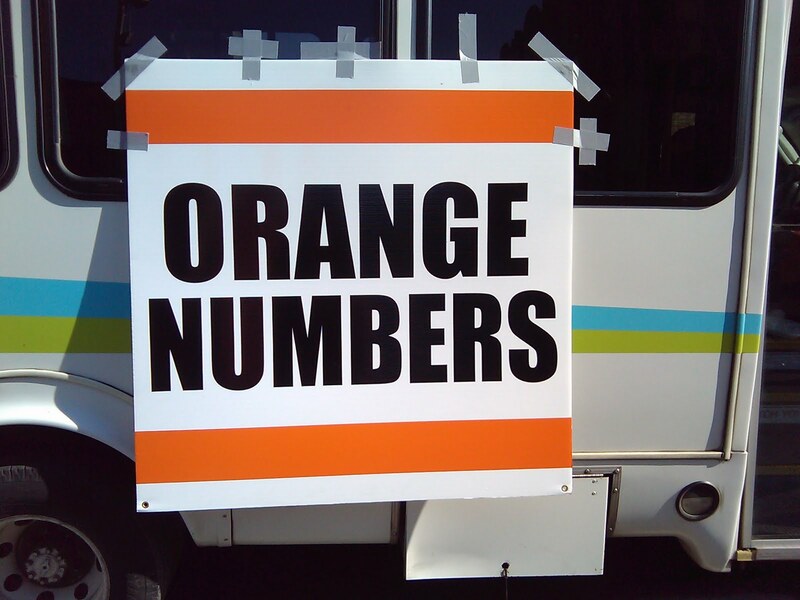 It soon became clear that people of all bib colors were trying -- and succeeding -- to enter the orange corral. Which was a bit weird. Finally, at around 9:20, and with a huge roar, our corral began their march forward. We merged onto Riverside Avenue and were completely stunned by the sheer mass of people stretching as far as the eye could see. 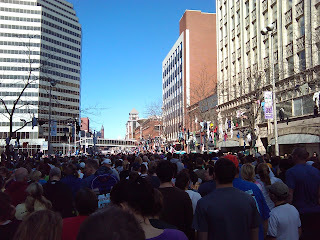 We moved forward a hundred feet or so at a time -- I don't think anyone was actually starting, but maybe? We were blocks and blocks from the start line still. We amused ourselves by admiring the trees. 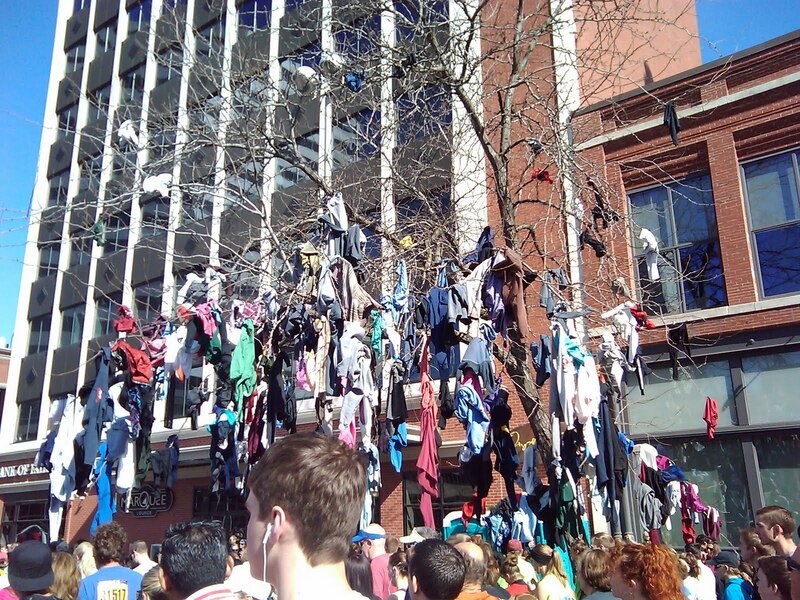 We had read somewhere about "shirts in the trees" and didn't really get it. 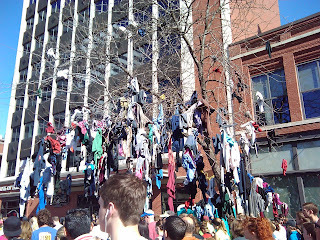 But apparently there's a tradition of throwing your "disposable" warm clothes into the trees in the starting corrals. 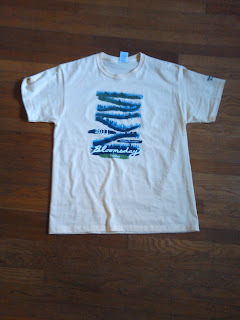 Race organizers collect it and donate it to charity. Nice. We crossed the start line completely packed in. We could do little more than jog almost in place, trying desperately to find some open ground. We had noticed while in the corrals that a huge number of people had their bibs pinned on their backs... a sure sign of new runners. And an indicator that people might not know the accepted behavior in a race. You know, the little things -- like not lining up at the front of a corral and walking 4 or 5 abreast? Like heeding the organizer's instructions to run left, walk right? Like knowing how to dispose of a half-full cup of water? We spent the first mile trying to break through the crowds, dodging here and there, careening from one side of the road to the other. Many times we had to just stop short because there just wasn't any room. We started to get frustrated. Okay, *I* started to get frustrated. And then it dawned on us. This was meant to be a fun run. We also started really noticing the bands -- loads of them, every couple of blocks. Lots of young kids in bands, which we thought was cool. We cheered for every one. My favorite was one I could only hear -- right at the bottom of Doomsday Hill, playing sped-up indie rock versions of Disney tunes. Awesome! We first glimpsed Doomsday Hill as we were sauntering down the hill to the river -- and it was astounding. Thousands of people streaming (slowly) up the hill that just went on and on. So when we crossed the bridge and headed up ourselves, we just put our heads down and went up up up. More than once we had that weird realization that we were walking and passing people who were jogging. 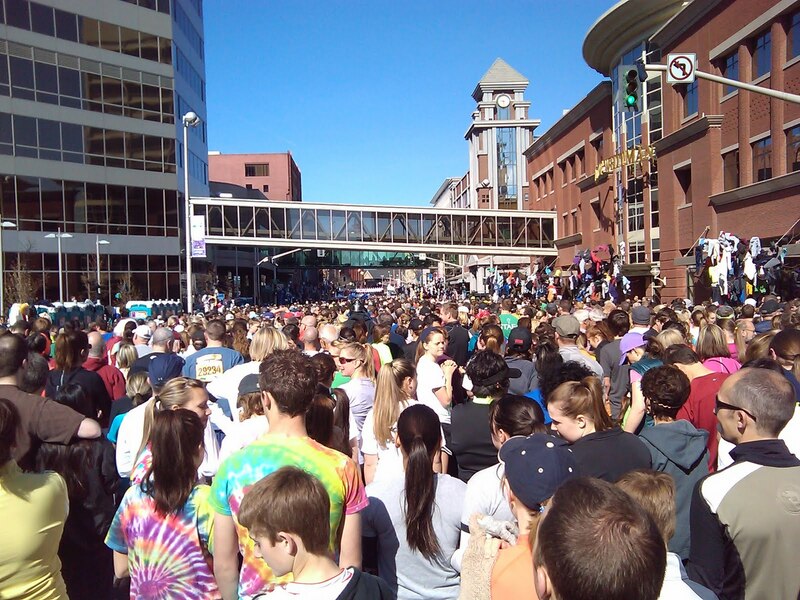 Once we hit the top of Doomsday, we returned to suburban Spokane, passing through neighborhoods full of people holding parties, showing off their finisher shirts, and spraying water at the runners. 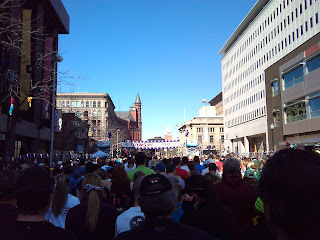 I was really surprised at just how hilly the course was -- lots of ups and downs the entire way. Suddenly, we were at the final turn. Still elbow to elbow with others, we decided to push through and run for a bit, holding hands across the finish line. So, hey, we didn't run much. But we had a lovely walk through Spokane with some very nice people, on a gorgeous day. Once we finished, we joined the crowds walking toward the shirt pick-up. We didn't have a lot of time -- we were supposed to be out of our hotel by noon -- but it was pretty efficient. Yellow. Yellow shirts. Oh well. 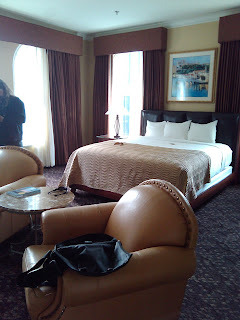 Then we hurried back to the hotel, quickly showered and packed, and were out of the room by 12:05. 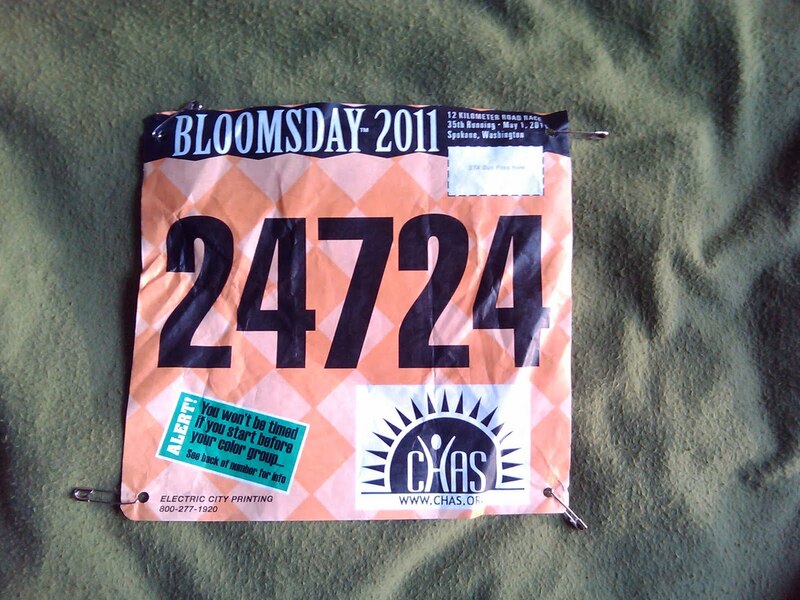 Would I run Bloomsday again? Probably not. (Heck, we barely ran it this year! Snort.) But I'm glad to have done this massive event. First things first -- it's not a marathon at all. It's a pub crawl. 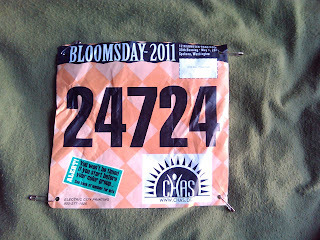 Wil and I are in Spokane to run Bloomsday -- one of the great northwest races. I've been wanting to run it for a few years, but we always seemed to have something else going on the first Sunday in May. We got into town early on Saturday, checked in to the fabulous Hotel Lusso, went to the "trade show" (not an expo....) to get our bibs, and then spent the day enjoying Riverfront Park, riding the skyride, and having pizza at the same place we stopped on our first cross-country road trip. We had been upgraded to a gorgeous suite at the Lusso, so pretty much just planned to get some takeout and hang out in our room for the evening -- resting up for the 12K the next day. 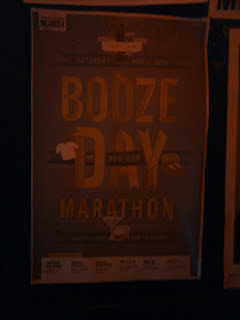 But while flipping through the pages of the Inlander, I came across this: "BOOZE DAY MARATHON, a pub crawl that spans six different bars between 5pm and 1:30 am. The premise is simple. Pick up a race packet at the Baby Bar, down a drink and run, stumble, skip or walk -- whatever you're capable of - to the next place." Sure we didn't have absurd costumes to wear, but it seemed too GMP to resist. So we presented ourselves at the Baby Bar (essentially the back room of Neato Burrito), registered, picked up our numbers (157 and 158), and had our first drink of the evening. The "special cocktail" at the Baby Bar is a greyhound -- but a greyhound like no other. (At least like none I've ever had!). The slice up a couple of pink grapefruit, squeeze them into your glass, and add a splash of vodka and some ice. Amazing. Dempsey's was a lot bigger, a lot quieter, and a lot friendlier. Their signature drink was a Jell-O shooter. In a syringe. For a dollar. Really hard to say no to that. 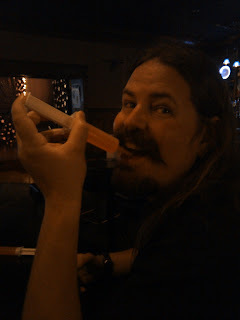 I mean, when was the last time you had a Jell-O shot? Lots of chatter there about coming back for the drag show at 10. But I was pretty sure we would be in our jimjams by then. After all, it was only about 6:30 by this point. Jello-O shooter. In a syringe. For a buck. Next stop: Far West Billiards. A very cool hangout, with a bunch of pool tables, good range of beers, and interesting cocktails. 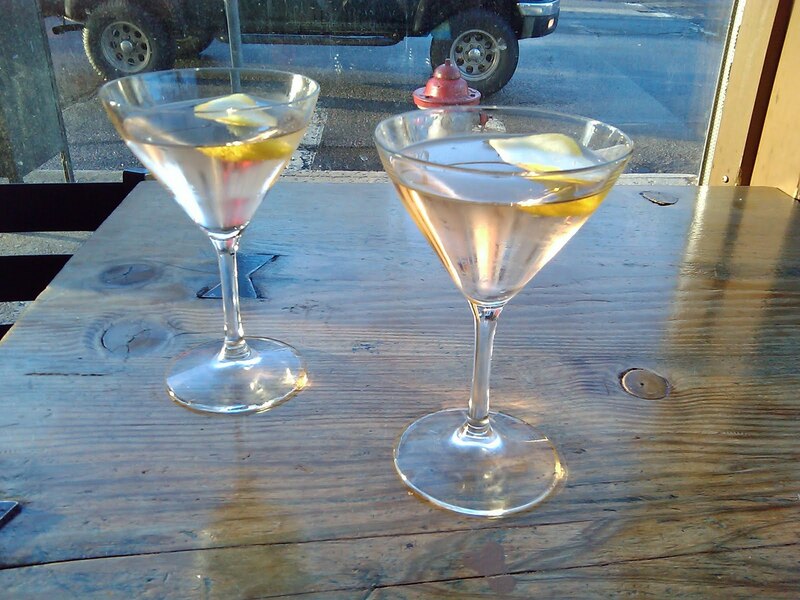 We had the daily featured drink, something called a Ginza Strip. Maybe. It was a sake cosmopolitan, I'm told. It tasted pretty strong... but I always think sake does. The sun had come out and was pouring in through the windows so we lingered there a little bit. But not too long, as we had to walk the longest stretch of the night -- 6 blocks, I think! 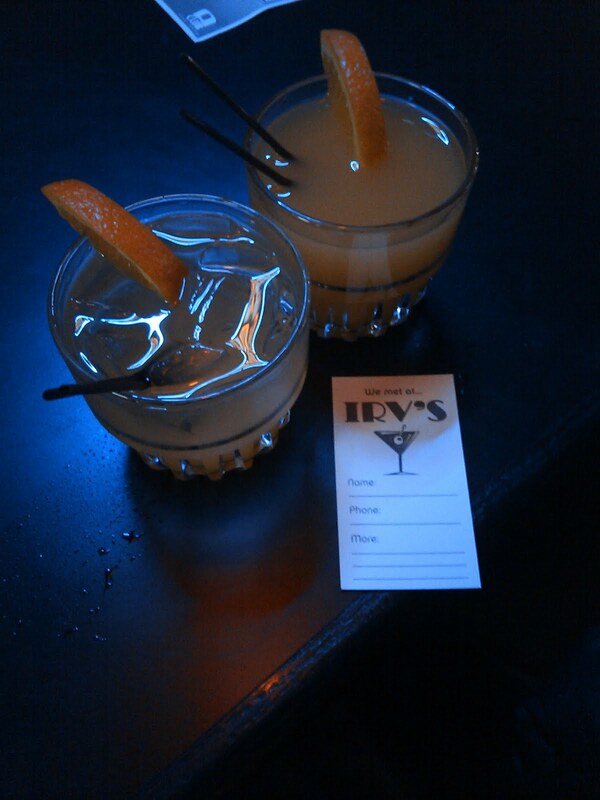 -- to Irv's. Officially the 6th spot on the tour (not that you had to go in order, mind you, as it was only our 4th), the crowd was pretty boisterous, loudly cheering everyone who came in with their numbers on. We had screwdrivers, played pinball, and admired the "hook-up cards" -- aka, Irv's business cards with space for a name, a phone number, and a note on the back. I mean, in the post-smoking world, it's not like they're gonna have matchbooks, right? Clever. Then across the street to the A-Club. Up a skinny and very long flight of stairs into... well, a completely unexpected space. It seemed to be broken up into a couple of different rooms. One big room had a band playing. (At 7:30. On a Sunday. Awesome!). Another room had another stage and two bars. 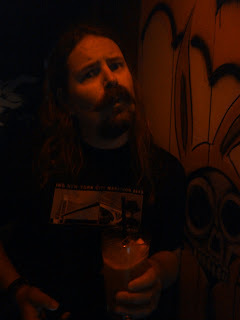 The place was full of 20-something metalheads, some lounging on couches. It was also really, really noisy. Which, of course, is exactly how you want a rock club to be. Full disclosure here: we didn't have a drink here. It wasn't really our scene last night. 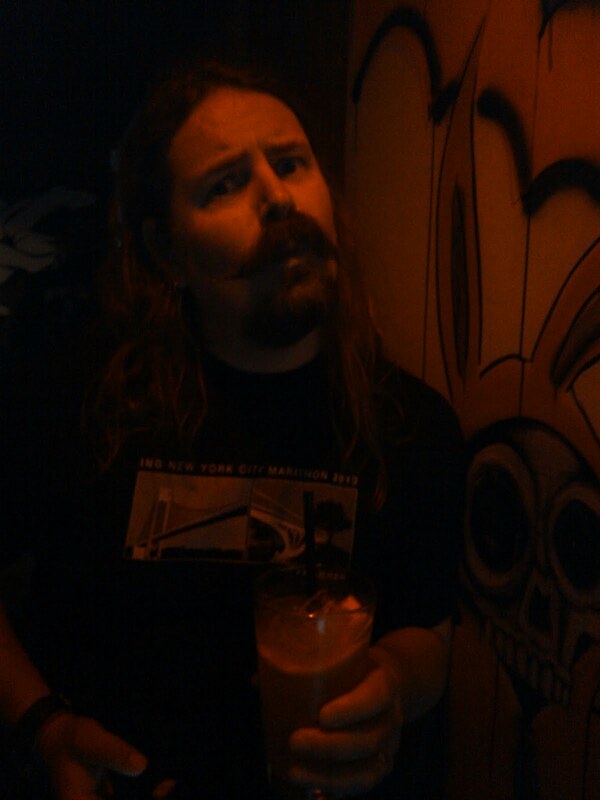 Oh, and the line at the bar was insane. Then back downstairs and a few doors down to Mootsy's, which felt a bit like home. Friendly, casual, perfect. Their special was a Jack and Coke, so we got a pair of those, took some stools by the windows, and watched others come and go. We then headed to Neato Burrito, where we turned in our cards, collected our very stylish t-shirts (again, nice to have finisher shirts! ), and bought two absolutely amazing Thai tofu burritos to go. A few minutes later we were seated in front of our fireplace watching Mythbusters and eating burritos. A fantastic Saturday night. the making of an AWESOME burrito!